Lately we have been seeing a lot of indie developers that create games, with graphics from the (g)olden days. Retro styled games with new mechanics, a great combination to show everyone that the gameplay is the most important factor of creating something great. 8Bitdo tries to do the same but when it comes to hardware. Today we are able to present you with our opinion of the NES30 Game Controller, a controller that resembles that old NES controller. The Nintendo Entertainment System (NES), the way we know it was released in 1985 and whilst this may seem like a long time ago, the iconic grey brick console with its square-ish controller will still present us with fond memories of our first gaming experiences. 8Bitdo took the design of the old NES controller, added extra buttons and triggers and shows us that retro is very much alive. They lay-out will differ a bit from the original controller, namely the buttons on the front are mapped as a rhomb, this has to do with the fact they added to buttons here. An extra addition are the triggers, to be able to present the user with enough buttons to handle more games and simply give you more options. Even with these extra tweaks, the ‘Nintendo-vibe’ this controller brings along, feels as if the original controller just received a very necessary update. All in all, a look that withstood the test of time. Nowadays most controllers are designed that we experience great comfort, that everything is placed at the right spot to make sure we have everything in reach in combination with the overall looks of course. 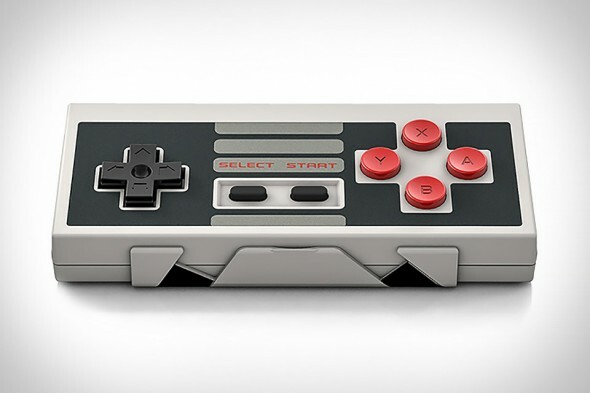 The NES30 Game Controller, takes a trip down memory lane, once again. You’ll notice that the controller feels just like roughly 30 years ago, which is not necessarily a bad thing. Seeing 8Bitdo promotes the device as a retro device that has risen from the dead, it’s great that it feels like the original controller. The buttons are mapped quite comfortably but the triggers might be a bit more ‘pointier’ than the ones we are used to these days. You will not really experience any discomfort when handling them but at first they may feel weird, seeing they weren’t on the original controller either. Simply put, you can compare handling the triggers with the overall feel of that of the triggers of the Nintendo 3DS. Overall, for retro games it’s a fun experience to grip this piece of updated retro hardware and it never gets ‘uncomfortable’. Of course, the controller is not comparable with the standards other hardware has nowadays but it remains a fun trip down memory lane. The biggest feature of the NES30 Game Controller is the fact that it supports a lot of platforms. Whilst this is a great thing, pairing up the device with all the necessary platforms might prove to be a bit trickier than you’d expect. Pairing up the controller with Android or even iOS for that matter, requires the OS to be hacked. In case of android, Root is need and in case of iOS jailbreak is needed. Those who already have done this beforehand, will have no issues with using the controller, seeing they will not have to perform any special or extra steps. 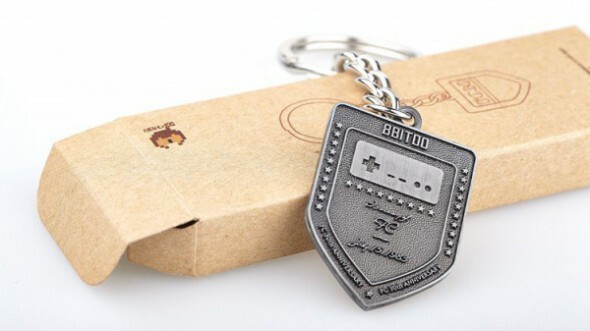 Those who haven’t ‘hacked’ their phones, will probably not jump for joy they have to perform such a thing in order to use 8Bitdo’s controller. That being said, when you have the necessary ‘hack’ in place, you will simply need to download the required software, install it on your phone and you’re pretty much good to go. You’re also able to pair up the device with the Wii. Again this proves to be a bit trickier, seeing you will have to boot up the device in the right mode, whilst pairing the device, whilst maybe even having to remove the batteries from the ‘player one’ controller that is currently active on your Wii console. This means you’ll have to try it a few times in order to get it working. The easiest mode of using the controller is when using it on the PC. You will have to connect the device with the enclosed USB to mini-USB cable, install the necessary software and presto. You’ll be able to enjoy your games, whilst using this nifty looking blast from the past. When browsing through the manual, you will notice that the game can be booted up in many different modes in order to pair up with the desired platform. You’ll know these by heart after a while, if you use the controller a lot. If not, it might be handy to keep the manual fairly closeby. A fun plastic gimmick to set your phone upright is also enclosed with the controller. This enables you to simply place your phone upon a table and then you’ll have your own little monitor to gaze at. The NES30 Game Controller does have a few difficulties to overcome to be able to use it on your portable devices but once you get it right and/or when using it on the PC, it happens to be great fun to use the controller. Design and the necessary button upgrades make this product from the past, very much alive this day.